Heating controller OUMAN EH-800 is intelligent heating controller for your home: saves energy, guarantees an even room temperature, suitable for central water heating systems, many types of measurements and alarm functions, GSM remote use. Your level of comfort increases when room temperatures stay at an even level even though outdoor temperatures change. You conserve energy when water entering the heating network is just the right temperature to maintain an optimal room temperature. The smart controller now takes even better account of differences in heating modes and structures. Heating controller OUMAN EH-800 controls and monitors for you. It is also environment friendly because it consumes less energy. Heating controller EH-800 is compatible with the most commonly used boiler and accumulator valves. Installation sets for Belimon district heat valves and Esben VRG valves can be obtained as optional equipment. You can install it yourself without any special tools. Detach the control knob from the valve and put the mounting kit into place. Press EH-800 into place, connect the sensors, plug it in and the unit is ready to use! Heating controller EH-800 contains preset basic settings for different types of heating. The first time you turn on the controller just select from the display the control mode of your house and it is ready to use. • Constant temperature (e.g., accumulator start-up/ charging or boiler circulating temperature control). The easy-to-use display is large and distinct and all necessary information can be seen at a glance. Recent measurement history can also be seen as a graphic display; in the morning you can check how a temperature drop occurred or how cold it got outdoors during the night. Heating controller OUMAN EH-800 is suitable for every house with central water heating whatever the source of heat; oil, the sun, wood, pellets, district heat, electricity or thermal heat. The too warm/cold function is a truly simple way to finely adjust heating. Turn the control knob in the desired direction to either increase or decrease heat. The controller makes the necessary set ting changes taking into account the room sensor if it is connected. Use the controller’s week/24 hour clock to program energy conserving temperature drops coinciding with your own weekly rhythm. The ratio between the outdoor temperature and the temperature of the water entering the heating system is determined and displayed using the curve. When the outdoor temperature drops, warmer water is let into the heating system and the opposite happens when the outdoor temperature rises. After adjusting settings on the curve, the change immediately appears on the curve on the controller’s display. The controller automatically corrects the curve if the user sets an unusual curve. It is also possible to select a 5 point curve that is freely adjustable. Put your boiler room on the network! 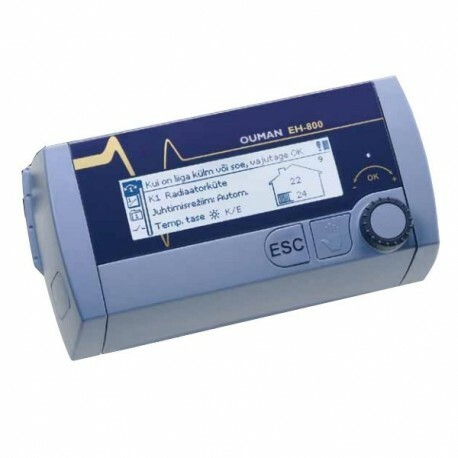 The heating controller OUMAN EH-800 can be used either with a home network or an internet web browser (not EH-800B). All you need is an ethernet cable to connect to an intranet. You can easily enter network settings and user names in the controller’s menu. We recommend using information secure Ouman 3G STD, 3G PRO or Ouman Access internet packages when connecting the controller to a public network. This ensures that traffic is shielded and gives you the option of a name service for administration of a changing IP- address. We recommend to use Internet Explorer, Mozilla Firefox or Google Chrome. It is possible to communicate with the controller via a GSM phone if a GSM modem has been connected to the controller. (optional equipment). Communication occurs by using key words. Your mobile phone can receive information about the controller’s measurements, active alarms, supply water or room temperature. You can also read and change the controller’s settings or control mode or switch the controller to a temperature drop or nominal temperature. An EXU-800 external unit can be connected to the controller making it possible to control a second heating circuit. As a result, e.g., heating of damp rooms can be controlled separately. For this to be possible, the facility’s heating system must be divided into two circuits. With the help of the EXU-800 external unit, the controller can expand to control two heating sources simultaneously. An older heating source and a newer, more environment-friendly heating source can be smartly controlled so that you always have enough heat. In addition, you can, e.g., use a thermostat controlled relay to control the pump that charges the solar collectors’ accumulator. This means that the controller always starts the pump when solar heat is available. Heating controller OUMAN EH-800 is a heating controller for private homes and business facilities having heating systems with circulating water. An external unit can be obtained as optional equipment making it possible to take a second control circuit into use. If a second control circuit has been taken into use, numbers 1 or 2 will appear on the main display indicating which control circuit is in use. The Heating controller OUMAN EH-800 model has an intra/ internet connection (the EH-800 B model does not have it).